Demographic variables, female-related predictors in particular, have an independent effect on political structure. Comparing different countries over time, when fertility rates decline, we observe a growth in democracy. Due to changes in family structure and in women’s economic and political status, Udi Sommer contends, countries with lower fertility rates are more likely to democratize. Fertility decline is one of the most striking global demographic phenomena of recent decades (Bongaarts 2002). During this period, many developing countries have gone through what is commonly referred to as their first demographic transition, when fertility rates plummeted from 6-8 children per woman to replacement levels (of 2 per woman) or less, at which point they entered into the second demographic transition. In 1950, the world’s average fertility rate was 5.05. By 2015, it had dropped to 2.49. In Asian countries, fertility rates dropped from 6.03 to 2.17 and in Latin America and the Caribbean, from 5.89 to 2.09. The impact of the worldwide fertility drop extends far beyond the economic and social spheres. A recent study, based on a sample of 151 countries, shows that fertility decline is systematically correlated with, and probably partly causes, an increase in democracy (Sommer 2018). Before studying the fertility-democracy link more broadly, one can first look at the experiences of one country as an illustration. This country is Indonesia. Figure 1 outlines trends over time in levels of democracy and fertility rates in Indonesia from 1972-2008. Fertility rates (red diamonds) dropped from over 5 children per woman to close to replacement levels during this period, a decline with momentous consequences for Indonesian society (McDonald 2014). Politically, this is the trend that led to the fall of the “New Order” and the end of the Suharto regime in 1998 after 31 years in power, and that ushered in the reform era (Reformasi). After the fall of Suharto, US President Bill Clinton urged Indonesia to begin “a real democratic transition” (New York Times, May 21 1998). The blue circles in Figure 1, which indicate democratic conditions in the country on a scale of 0 (least democratic) to 10 (most), suggest that “Clinton’s advice” was perhaps indeed heeded. Rather than degenerating into a period of military dictatorship, the country experienced substantial and consistent improvement in its democracy scores in the following years, a fact that was previously attributed to declining fertility (Ananta 2006). Specifically, of the 14 ethnic groups in the country, the two that played a key role in national politics (Javanese and Madurese), and were instrumental in bringing about the fall of Suharto and the reform that followed, were those with considerably lower fertility rates (Ananta et al. 2004). Given the projected decline in fertility rates for other ethnic groups as well, with the majority of the population in Indonesia projected by the UN to complete the first demographic transition by 2025, the prognosis for Indonesian democracy is positive. Similar figures could be produced for other countries that have become more democratic in the past 2-3 decades, including countries such as Mexico and South Africa. How, then, can lower fertility be linked to the rise of democracy? At least two mechanisms can mediate the effects of fertility on democracy: family structure on the one hand, and the economic and political empowerment of women on the other. In a marked departure from most theories linking demographics and political structure—which are largely oriented towards the effects of male-related demographics on politics—here the focus is on the effects of women-related demographic variables on politics. Lower fertility entails changes in family structure, and smaller families can invest more resources in educating their children. Furthermore, in polities with smaller families, levels of uncertainty about future events are typically lower. Individuals, then, are more likely to plan their future, and are better able to do so, among other things, by participating in politics, articulating their interests and claiming their rights. Further, lower fertility rates lead to democracy through their crucial effect on women’s role in the economy and in political life. With lower fertility, women are better educated and are more likely to hold salaried jobs and take an active part in economic activity. At the same time, they are also more likely to use these extra resources (time, education, and money) to start holding and defending their own point of view, at both family and societal level. A mother of seven children in 1950 was likely preoccupied with meeting the physiological needs of her offspring, which left her little time to consider the social, economic and political reality of the nation she lived in. Conversely, a mother (of just one or two children) in the early 21st century is more likely to have the available resources to take an interest in these matters. This is also linked to the fact that children are nowadays less a form of insurance for the sustenance of the family and more a means for self-actualization (their own as well as their mothers’). Finally, lower fertility is also often associated with an increase in women’s average age at first birth, a factor with positive implications for their educational attainment, employment opportunities and political incorporation. The key argument is therefore that as fertility declines, a country is more likely to be democratic, even when traditional predictors of democracy are controlled for. 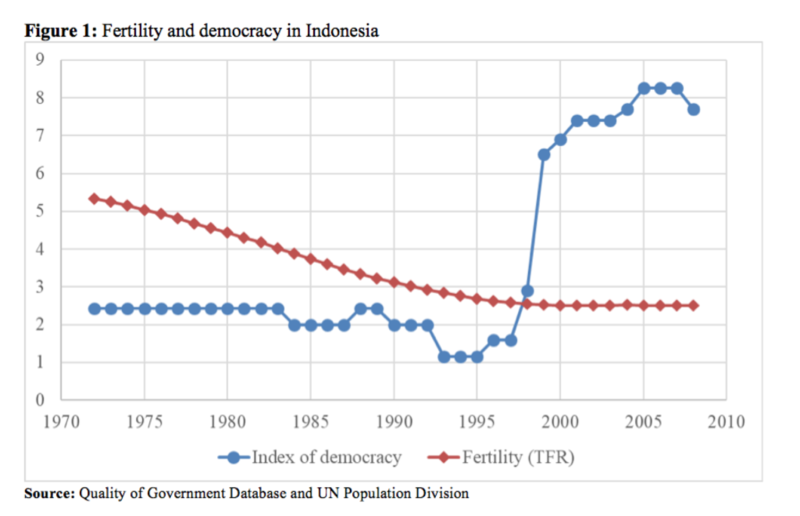 And indeed, when other relevant variables are held constant (e.g., globalization, economic conditions, religious constituencies and colonial heritage), fertility is systematically linked to the degree of democracy of a country (as measured by the Quality of Government Database, as in Figure 1). This is true not just in Indonesia, South Africa or Mexico, but much more broadly. Indeed, in a sample of over 150 countries, the results remain the same; lower fertility rates lead to higher levels of democracy. Note that the relationship between fertility and democracy is observable also in countries with low GDP per capita, or with other potentially unfavorable conditions (e.g., a pervasive role of religious authorities, or a tradition of military regimes). The findings from this study also have implications for family planning programs at the national and international levels, with ramifications beyond public health or medical policies. For instance, the findings here indicate that apart from their importance in fighting the spread of sexually transmitted disease (STDs) and their role in reproductive health, international programs promoting contraceptives and family planning may also bring about momentous political shifts. As fertility rates worldwide are converging towards replacement level, this universal demographic trend is likely also to lead to democratization, even in corners of the globe where political and economic conditions have traditionally been perceived as standing in the way of democratic reforms. Recent political trends towards democracy in Indonesia, across the Arab world, and in Latin America are prime examples. Individuals’ propensity to express their views, articulate their needs, freely form political groups and in some cases act to overthrow dictators can be accounted for, at least partly, by the fact that fertility rates have fallen in these places in the last three to four decades. With fertility rates projected to decline considerably in Africa in the coming decades, regions such as Sub-Saharan Africa will likely be of particular interest for students of democracy and democratization.